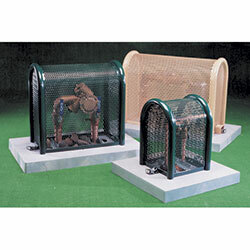 These rugged enclosures protect equipment located in unsecured areas. Ideal for protecting backflow preventers, air release valves and other equipment from unwanted tampering, weather elements, or to simply improve visual appearance in public areas. GuardShack enclosures feature heavy steel tubing rolled into an 180º arc with intermediate sections and end panels made of heavy expanded metal. All models feature a powder-coated finish for total coverage and superior protection from the elements. Stainless steel construction for seacoast areas is also available. All enclosures are shipped with mounting hardware, including a hasp for use with a padlock. Enclosures may be hinged or designed to simply lift off of a poured concrete pad. Additional sizes are available with inside dimensions up to 200"L x 38"W x 56-3/4”H. When ordering, specify either high-gloss Forest Green or Woodland Tan color.